Riddle: What do a Buddhist, a Jew, and a Muslim do to celebrate the most high of feast days in the Christian calendar, Christmas? They go to a Chinese restaurant for their yearly seasonal “celebration”. After all, where else would be open on this most anticipated winter holiday when most folks wake up to a shower of gifts and a large spread of home-cooked meals and sweet delights? Chinese eateries are very cognizant of the Asian population’s preference for feasting on their restaurant delights on such holidays, and they prepare themselves for such onslaught of customers. With my usual suspects in tow, along with a new friend who hails from Togo, we headed to Full Key, a regular Cantonese haunt located in Wheaton, MD, that I have not stepped into in many moons, which explains this much tardy write-up on this place. Arriving at the right time with no waiting line and a recently abandoned table covered with its aftermath, it was not long before we settled into the well-worn booth. With a medium din level of diners and clinking bowls in the background, we quickly ordered our customary opener – Shrimp Dumpling Soup. The bowl arrived with some whitish dumplings visible through a clear broth, much like a Monet of submerged lilies in a lake. But one bite brought clarity with its tasty presence. Under the silky thin dough skin, a slightly firm stuffing of well-seasoned minced shrimp mixed with some minced pork excites the palate with its Umami savoriness, along with strands of wood fungus giving each mouthful a slight soft crunch to these slightly bouncy bites. The clear soup is the strong supporting actor to the dumplings, made from bonito flakes and meat stocks (I learned their secret recipe from a restauranter friend) , that adds just the right amount of additional Umami-ness to each sip. 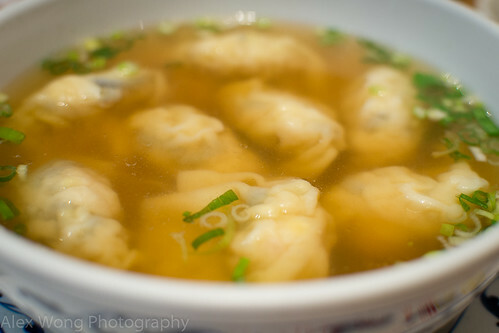 A great starter for a cold winter day that brings back memories of eating it in Southeast Asia. 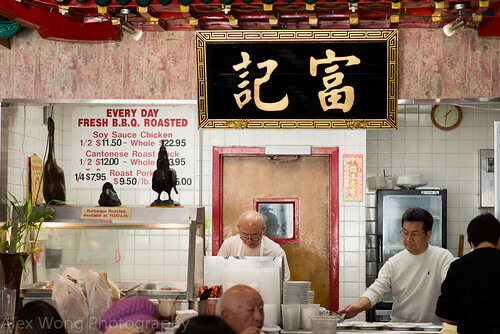 This place is well-known for Hong Kong-style Noodle Soup dishes that are a main staple of the cuisine. 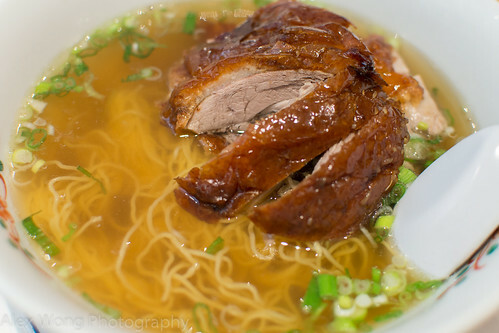 My Muslim friend decided to order a bowl accompanied by pieces of roast duck, following his dietary restrictions. However, being a carnivore Buddhist, I prefer mine with wanton and a side of Chinese vegetables, Choy Sum. Back to the noodle – strand of alkaline noodles are slightly chewy and eggy with the perfect al dente bite. Again, the bonito-meat broth is the savory clean foil to the main ingredients. 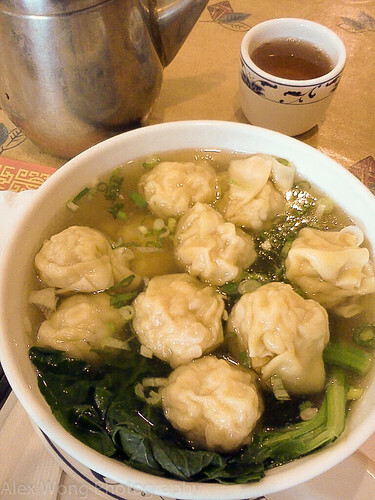 The wanton dumplings are just like the shrimp version above except for its firmer texture due to the inverse proportions of shrimp and pork, but not short of its rich flavors. A requested addition of greens makes the bowl a complete meal with most food groups included as well as a mouthful of textures and flavors. I mentally kick myself for not coming here more often for this bowlful of childhood memories of Sunday coffee shop breakfast that I missed dearly, especially given its so-goodness here. 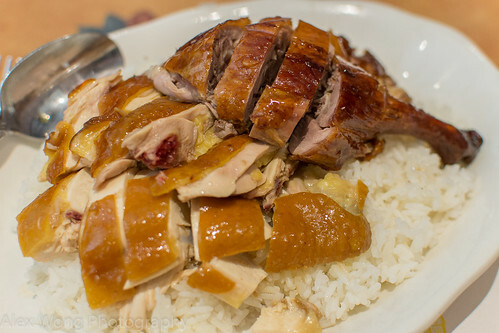 Any dish category that this eatery is known for is the Cantonese-styled roast meats. Unfortunately, when we arrived there, the Roast Pork was already gone – the waiter told us that customers were coming in with 5-lb orders for their family dinners – it must be that good. My African friend was stuck with a choice of Roast Duck and Roast Chicken. He told me he enjoyed the duck including the slightly fatty skin (not quite Peking Duck here) and the slightly dark gamey notes that this dark-meat poultry is known for. The chicken is roasted with a mild soy sauce on the skin which was lacking in flavor for my friend, despite the tasty marinade sauce served on the side. The mentioned fellow vowed to come back and get a taste of that ever-so-popular roast pork. Another style of noodle dish served here comes not with soup but stir-fried. On this day, I was inspired by the sight of a familiar dish that I had not tasted for some time – Beef and Broccoli Chow Foon. 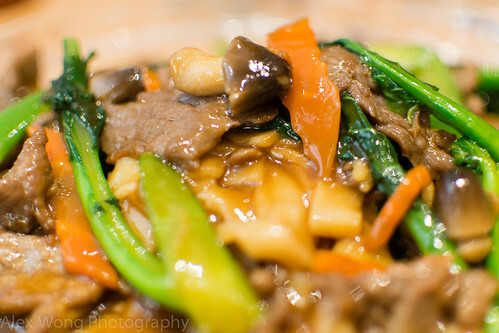 Wide strands of rice noodles have been slightly wok-fried and covered with a thick brown sauce with slivers of beef, carrots, Chinese broccoli (Gailan), and straw mushrooms swimming in it. The noodles were bouncy fresh with a slight wok-char flavor, beef seasoned well and tender, vegetables still crunchy but not raw, and the mushrooms slightly woodsy, all disparate elements brought together by the tasty brown sauce tasting of oyster sauce and soy. Looks like the back kitchen is as skilful with the fried dishes as the front noodle and roast meat counter. Equally deft in execution as with the above dish was an order of Deep Fried Shrimp, Scallops & Squid with Spicy Salt. 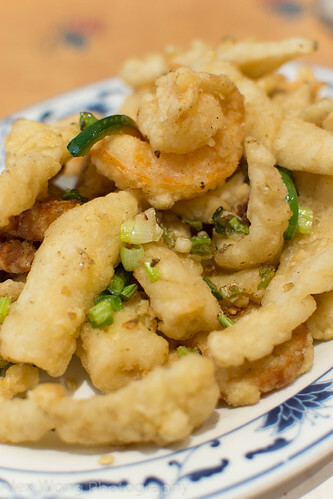 Bits of seafood have been lightly battered and deep-fried until crispy, seasoned with salt and a topping of fried jalapeño slices and green onions. This dish hit the spot for my Jewish/Latino/Agnostic ex-roomie. The crispy batter coats morsels of fresh-tasting moist pieces of seafood, seasoned with a sprinkling of salt. The fried green pepper slices and green onions added the necessary spicy heat and slight sweet pungency. As my friend put it to my friend from Togo, it is not an everyday dish, but worth relishing every bit of the barely greasy, crispy and salty bites. Deep-fried and salty seafood – Yummm! I sometimes wonder why I have deserted this Cantonese style eatery as of late after many years of patronizing it. I guess I can blame it on gastronomic wanderlust that is enabled by the myriad of cuisines that the DC area offers to its citizens. It could also be palate apathy that tends to set in after one has grown up eating certain cuisines his or her whole life. But this last visit only reminded me that yes, these familiar dishes are still worth raving about, especially when well-executed as in the case of Full Key. So instead of just a yearly visit, I will be back more often for more of the wonderful soup, noodle, rice, roast meat, and seafood dishes that hit both the gastronomic and nostalgic spots.